Nomenklatura of Signs (audiovisual projection), Keep the light on ... , Centre National de l'Audiovisuel, Clerveaux Castle, Luxemburg. 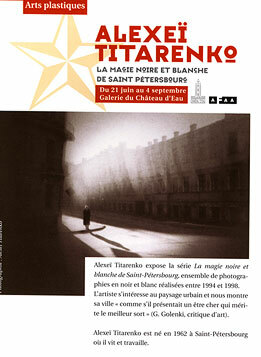 Ville des Ombres: Alexey Titarenko, photographies, Musée de Nice, Galeries des Ponchettes, Nice, France. 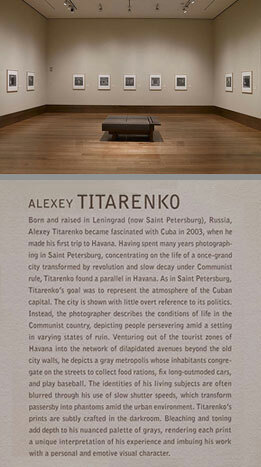 Alexey Titarenko was born on Vassilievsky Island in Leningrad (now St.Petersburg) in 1962. He began taking pictures in 1971, at the age of nine, and graduated from the Leningrad Public University of Society-related Professions in 1978 with a degree in Photojournalism. 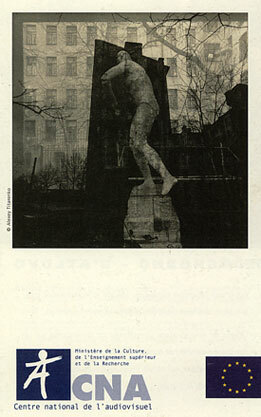 That same year, Titarenko became a member of the independent photo club Zerkalo (The Mirror) and held his first solo exhibition. In 1983, he received a Master's degree in Cinematic and Photographic Arts from the Leningrad Institute of Culture. Two years later, he was dismissed from obligatory military service after having served eighteen months in the Soviet Army as an infantry soldier. 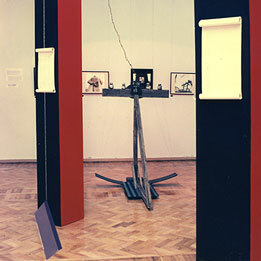 He began work on the series of collages and photomontages Nomenklatura of Signs, a commentary on the Communist regime as an oppressive system hat converts citizens into mere signs and, by 1989, received his first solo exhibition in Western Europe, in Paris. 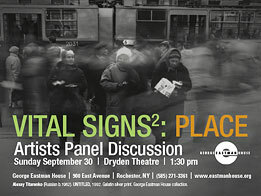 Also in 1989, Nomenklatura of Signs was included in Photostroyka, a major show of new Soviet photography that toured the US. His works are in the collections of major European and American museums, including The State Russian Museum (St. Petersburg); The Getty Museum (Los Angeles); the Philadelphia Museum of Fine Art; George Eastman House (Rochester, N.Y.); the Museum of Fine Arts (Boston); The Museum of Fine Arts (Columbus, Ohio); the Museum of Fine Arts (Houston); the Museum of Photographic Arts (San Diego); the Davis Museum and Cultural Center at Wellesley College (Mass. ); the European House of Photography (Paris); the Southeast Museum of Photography (Daytona Beach, Fla.); the Santa Barbara Museum of Fin Arts (Cal. ); the Jane Voorhees Zimmerli Art Museum at Rutgers University (N.J.); the Reattu Museum of Fine Arts (Arles); and the Musee de l’Elysee Museum for Photography (Lausanne).